One of the most intimidating aspects of infusing technology into curriculum is that educators often believe that they will have to master and then teach their students to use new technology tools before assigning a project. These concerns are understandable as our time for professional development is finite and school curricula are already packed. However, consider the impact if, rather than focusing on new tools, we explored the skills students need to learn and then incorporated the most effective digital resources to accomplish those objectives. Good teachers know that learning is all about the skills that students develop in the process of a lesson, activity or project. Most teachers are exposed to digitally infused curriculum with flashy projects like documentaries, blogs, Minecraft activities, etc. However, the most important thing is to look past the flash. Before you sit down to design a project, think about what skills you want students to learn in your class. For example, do you want your students to learn how to deeply research and assess sources effectively? Do you want them to demonstrate their understanding of a theoretical physics concept? Start with your traditional lesson objectives and build off those. When you give your students a digitally infused project, there are different ways to structure it that will maintain your rigorous expectations but not require a lot of time teaching new software or hardware tools. For example, history students could use digital tools to make documentaries. Give students clear parameters (such as time limits) and expectations for the project, but let them choose their own video tools and hardware. 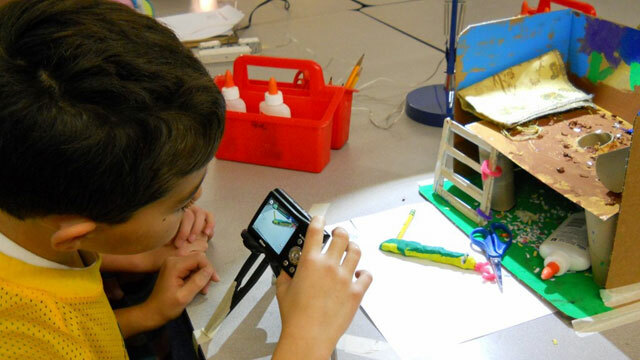 The project should be open-ended enough that students can get creative: by using appropriately licensed images, creating a live-action video or even incorporating their own artwork. Shawn McCusker, social studies department chair at Libertyville High School in Illinois, teaches his students about world governments by asking them to create visual presentations that demonstrate their topic. Students are permitted to create something as simple as a Venn diagram, but he also maintains a “Best of All Time!” list and encourages his students to blow him away. One year, he got an amazing stop motion picture comparing Adam Smith with Karl Marx. Ultimately, when students explore topics independently, solving problems as they arise, they become more invested in their own learning. Allowing them to creatively develop their own finished products gives them some control over learning artifacts they produce to demonstrate their understanding. Keep your parameters broad enough so that students can explore their passions. You will get different results, but don't be surprised if they amaze you. If you provide students a broad outline and allow them to choose their own tools, they can be more creative in the overall process. And, while it's normal to want to understand the tools students will be using before assigning a project, don't fret too much about teaching them new tools. Most software and hardware today is designed to be intuitive. There are numerous "how-to" videos readily available online, and a quick Google search will often return an easy solution. Requiring students to find answers to their own problems, even relying on peers for assistance, helps promote a culture of teamwork. Allowing students to navigate and learn their own tools is a great way to teach them the important skill of creative problem-solving. This is especially beneficial in schools that don't have one-to-one device programs; students have to learn to use whatever tools are available to them (PC, Mac, tablet, smartphone, etc) more effectively. We live in a world that is collaborative, but classrooms don't always reflect that reality. Instead of creating singular, insulated assignments, encourage students to collaborate. You don't need to be an expert in everything. Instead, allow them to find the classmates, peers or online resources that can assist them. After all, when was the last time you worked in complete isolation on a personal or professional project? Tech projects are a great opportunity to encourage students to learn real-world skills of working with others. At the end of the day, incorporating a digital curriculum is not about teaching students to use a particular device or piece of software. It's about developing the skills necessary for them to be successful.